Dan Bezzant's son, Jackson, lives with Treacher Collins syndrome. The illness affects the development of bone and tissue on a person's face, and it varies greatly in severity. Some children are born with cleft palates, and in extreme situations, an individual's respiratory functions can be threatened by the disease. Those born with the syndrome who are fortunate enough to have access to care can undergo corrective surgery to reconstruct their faces. Depending on how much of a person's face is affected by the disease, much of their young lives are spent on and off the operating table. 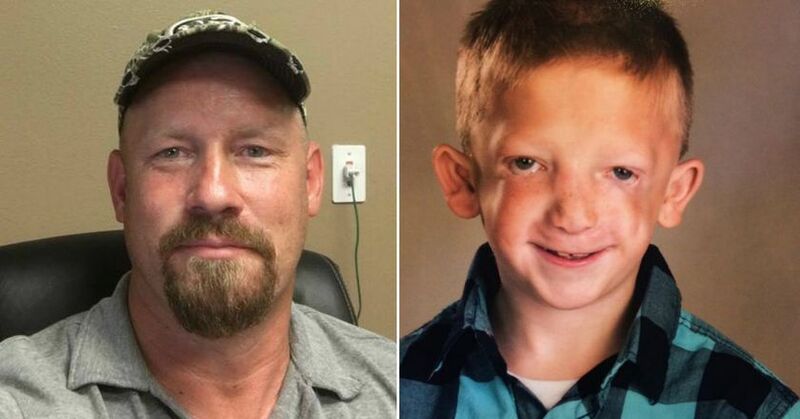 Due to his illness, Jackson is constantly bullied by other kids at school and even though he's only 7-years-old, he expressed to his father that he didn't want to live anymore. Hurt by the pain his son endured on a daily basis, Bezzant took to Facebook to encourage other parents to teach their kids compassion. My heart is in pieces right now...my soul feels like it's ripping from my chest...this beautiful young man my son Jackson has to endure a constant barrage of derogatory comments and ignorance like I've never witnessed. He is called ugly and freak and monster on a daily basis by his peers at school. He talks about suicide...he's not quite 8! He says he has no friends and everyone hates him. Kids throw rocks at him and push him shouting these horrific words...please please take a minute and imagine if this were your child. Take a minute to educate your children about special needs. Talk to them about compassion and love for our fellow man. His condition is called Treacher Collins. Maybe even look it up. He's endured horrific surgery and has several more in the coming years. Anyway...I could go on...but please educate your children. Please...share this. This shouldn't be happening...to anyone. He included a PO Box where people could send cards and words of encouragement to his son in the post, as well. Bezzant's plea went viral, with over 35,000 people sharing it and 20,000 commenting their support for Jackson. In an interview with Inside Edition, Bezzant says when he discovered children at school were calling his son "ugly" and a "freak," he broke down sobbing in his driveway, which prompted him to make the post. Members of Bezzant's community have already reached out with support, saying that they'll look out for Jackson and teach other children to be kinder to him. He also learned of two other children with Treacher Collins syndrome, and he plans on arranging a playdate and lunch with their families so Jackson will know he's not alone. He's been floored by the response and the love shown for his son. "I am receiving constant messages of people sending love and prayers for Jackson. All I am asking is that you teach your children about bullying and making sure that kids understand that people are built differently and God loves us all. I hope it brings awareness to the topic."